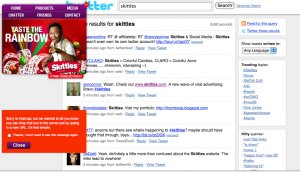 Skittles have launched a new website, well in fact they’ve launched a lot of links to various web 2.0 and social media sites where their customers are talking about them. 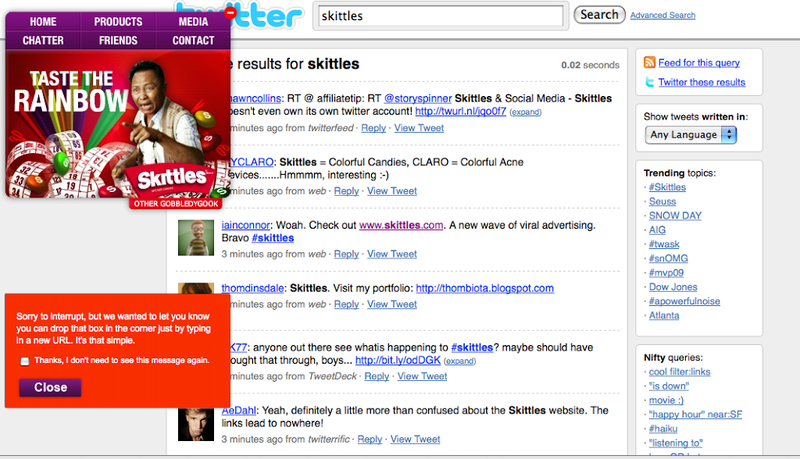 The homepage shows various chatter about Skittles on Twitter Search and other navigation links point to their Facebook page, YouTube for Video and Wikipedia for product information. Skittles parent company, Mars, have essentially handed over control of their homepage to Twitter users, and with updates in real time you can see both positive and negative comments posted. It’s a big step away from the traditional use of websites in FMCG for delivering controlled messages to consumers but a very interesting experiment in social media. The novelty of this move will no doubt generate a lot of press coverage and exposure in blogs and social media for Skittles. The website launch has certainly got people talking, the Twittersphere is abuzz today with mentions of Skittles (and indeed some nostalgic purchasing of Skittles it would seem). 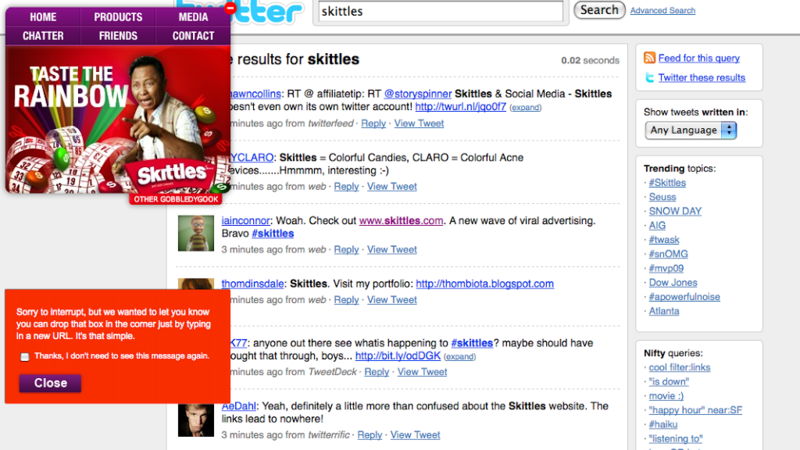 However as the buzz around this launch settles I wonder if people will still be talking about Skittles on Twitter. In fact the design of the website seems to suggest that a more traditional homepage may be waiting in the wings, with separate links for Home and Chatter both pointing to Twitter Search at the moment. Skittles have taken a brave step into this new world and I’m sure we’ll see many companies follow with a more gentle integration of social media into their online presence in the coming months.